Last year while running Hood to Coast I remember seeing the Handful team in bright orange, they were smiling, the whole team was out at every transition and they were cheering on every team. They were positive, and having an amazing time… when I learned I would not join nuun at HTC this year the Handful gals immediately popped in my brain… BUT… I didn't want to run for a corporation if I didn't like the product..
Sooo.. I ordered a bra, they were having end of the season SALES HERE.. I also ordered a bucket cap because it was adorable and I love orange.. The product came quickly and I wore the bra that night.. SCORE!! I love the support and femininity of the Handful bra.. I wrote an email expressing interest in joining the team, not expecting a reply. To my surprise and DELIGHT the CEO replied and said they had a spot due to an injury.. I have found a team for Hood to Coast!! I will be in Van #2, my hope was to be Van #1, but to be able to run the Mother of all Relays is a treasure regardless of the Van.. My team is totally organized, the team Captain is stellar!! I am excited to make new friends on the run. Wow is my husband gaining some SPEED… For those of you who keep up with me on Dailymile HERE (http://www.dailymile.com/people/tallmomontherun#ref=tophd) you have noticed. He has the endurance and suddenly his legs want to MOVE.. It was pouring rain, I mean pouring!! But we knew we had weekend travel plans so we had to fit in a good 10K, probably not the best idea since I was sick earlier in the week. We didn't set out to break any records but when the first mile chimed and we felt great we just went with it.. NOTE: We were the only CRAZIES on the trail. Finish time- 54:49, in the pouring rain, pushing the boys (they were under the rain cover).. This is nearly a 3 minute Family Pushing Boys PR, last week we ran a 57:39..
AMAZED at my husband and his progress, this was sub 9:00 pace (8:50)!! New outfit from the Nike Outlet SCORE for $30!! The trail was PACKED!! There was a bike event of some sort and a group of about 20 cub scouts that we leap frogged with a few times. It was about 65, we gulped down our 2 water bottles and then some. Our boys were good the second half of the run, we had to stop a few times for various reasons (snacks, to water the plants, etc), always for them..
1:34:02- 9:20 Average pace!! When I finally get MM out from behind that stroller and in a race scenario it is going to be amazing! ****2 weeks to race day. Do you have any Running HAPPY news to report?? Leave a comment if you will be at any of the races above.. I love love meeting new people. OMG Where is this race at --- July 15th- Fueled by Fine Wine Half Marathon???? ... You and your Husband are AMAZING!! I wish my Boyfriend would run with me... But I settle for him riding his horse while I run.. haha.. Your schedule is insane. Makes me feel like a slacker. So psyched that you found a HTC team. I'm coming in late on Tuesday of that week and leaving late on Sunday. Hope we can find some time to meet up. I'll be at Seattle RNR and H2C! Also, if the Fueled by Fine Wine is the one in Dundee, Oregon, I don't live too far from there so I could come out and cheer you on! Great weekend! I'm so excited you found an HTC team. MM is getting so fast, you guys are going to do great in Tacoma. Hugs. I love the Handful company! I was so disappointed I wan't picked for the Nuun team this year. If they have any more openings let me know!! Like I said on Dailymile, your husband is a machine and is going to kill his 1/2 marathon. 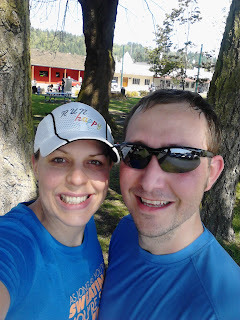 My husband and I are running the Vermont City Marathon in 3 weeks and I am sooooooo excited. My hubby only races a few times a year and this is the one weekend we go away alone and race. Can't wait!!!! Congrats on getting to run with handful, I love them. Both the bra and the ladies that work there, I go the bright orange hat too and their bras are all I use. I will be at hood to coast running with team beef Montana, I don't know what van I will be in yet but hope to see you! 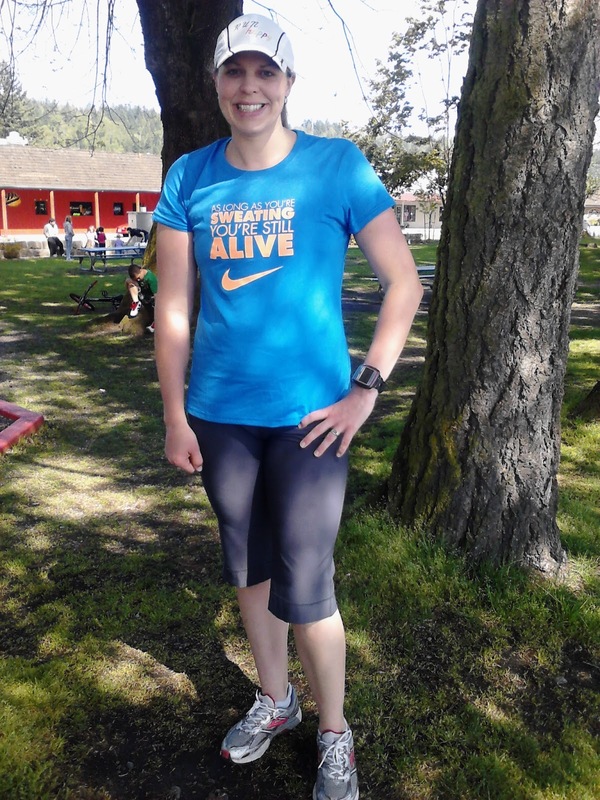 SO excited someone got smart and invited you on to a Hood to Coast team!! :) My run happy news is definitely that Nuun asked me to run the Ragnar relay with them! Although I was a little sad about HTC, Ragnar is so near and dear to my heart I'm more excited to run that relay with them now! Happy news: I'm starting to pick up speed, and I'm considering signing up for my second half marathon. Glad you found a hood to coast team!! I would love to do that race one day!! So happy you found a team! And you and hubbs are the speedy duo. He is going to put in an amazing first half marathon time. Love your racing schedule. Looks like loads of fun racing this summer! I got nothing. No schedule no plan no training...nothing, not really any spark either. =/ I wished I was doing a tri on Sunday but for now I am resting-body and spirit. I feel broken. Ugh....I need to come to WA. Ok, done being down time to go try to play frisbee with LB! Congrats CONGRATS on the Hood to Coast team! that's awesome! And your husband is getting so speedy so fast! Nice runs! Yay!!! So happy for you! We can play at the finish!! I love the Handful ladies. I have a great pic with a crew of orange and they even gave me an orange hat! Happy for you! Way to make it happen! Looks like you have a great race calendar this year! My run HAPPY news is that I'm actually running and feeling good! Congrats on getting on the team! As for the Handful...I need to upgrade my circa 1999 sports bra collection! I love reading your blog!! Congrats!! I love that you run with your husband!! 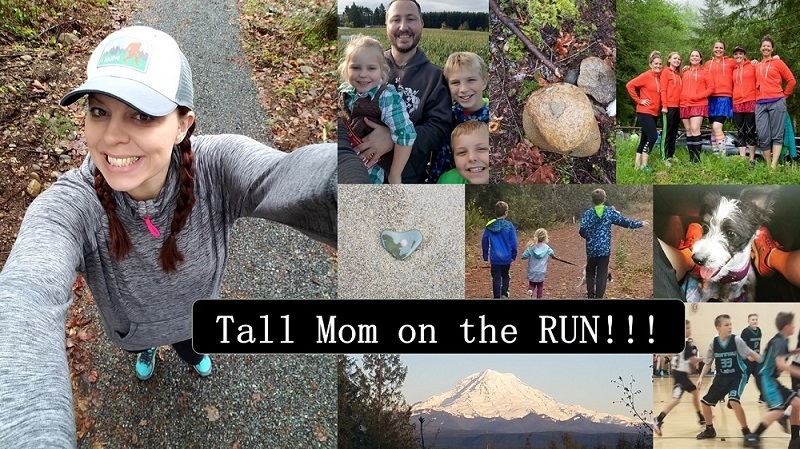 I'm running Pearl Harbor 10k this mother's day. My sis is running too and my mom will be cheering from sidelines. We are going on girls only trip to celebrate my mom's 60th. Totally pumped to start my running year like this. I'm so happy that you have found a team to be on! Lucky them!!! I have heard so much about the bra...I really need to check them out! You have a busy schedule girlie...enjoy every bit!!! MM is so ready for his first half marathon. You are a good coach! !